I wear anywhere between a size 18 and a size 22, depending on the store. 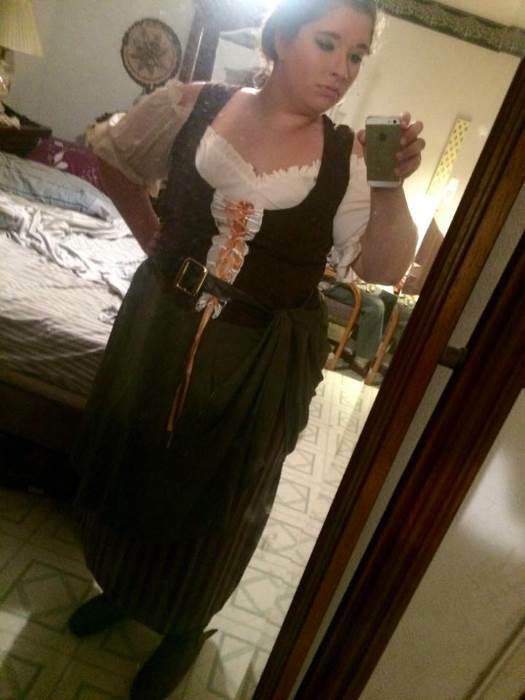 My measurements were well within the measurements on the 3x on the costume, and it fits perfectly. I LOVE it! I will say that it's snugER, but it's definitely not so snug that it's uncomfortable. I can move freely without worrying about anything ripping or tearing. The belt is a little flimsy in the sense that it doesn't stay belted, but it's nothing a carefully hidden safety pin can't fix. Other than that the dress is really good quality. Not the crap that costumes are normally made out of. Pay attention to the measurements; if your measurements fit the sizing measurements, it will more than likely fit. I was a little worried after reading the other reviews, but I'm SO glad I took the chance and went ahead and bought it. I ordered a 3x, believing that since the sizing indicated a 2X would be sufficient, it would fit. It doesn't even come close to fitting from the waist up. If the bodice were detachable, it might work; however, it's not and it looks awful. Unfortunately, I'll be returning the costume tomorrow. Good quality material, though. Cute but way too small. If you want this order a size bigger. I had to return it. I even ordered a size larger than what the size chart said would fit me, but it still didn't fit. I was extremely disappointed. I will say, however, that the material was great, and if this had fit, I'm sure I would have been pleased. I ordered larger than my normal store size. Follow the measurements for the costume NOT store sizes. It fit perfectly!! Quality was excellent. Many compliments. Thank you. I received my order today and it was exactly as shown in the picture. The fit was excellent. The quality of the material was more than I expected and was quite pleased. I did not expect my parcel until the 26th of Feb and it arrived on the 22nd. Kudos to Halloween Costumes---I will definitely be ordering again. Very nicely made. The top of bodice's elastic is too loose causing it to gape. And the size is more like and extra large or 1x on their 3 X. Otherwise I like the costume. 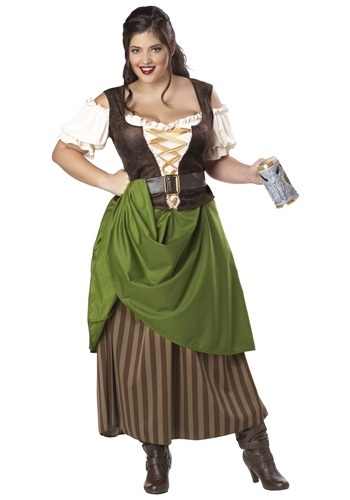 Nothing says Medieval "Hee Haw Honey" like a working wench costume! Sizing is good, but the gold ribbon down the front, while cute, is not as functional as I had hoped.